"The Master Sword has returned to the forest"
We already know that The Legend of Zelda: Breath of the Wild has a few interesting glitches which can be exploited to benefit the player and even break the game, but this latest discovery is perhaps the most interesting one yet. It has been found that by getting enemies to shoot a certain number of arrows you can totally mess up the game's memory management. 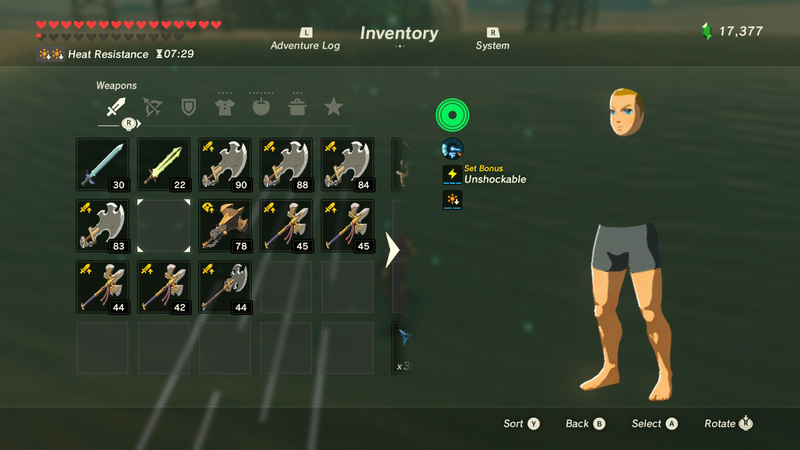 When enough arrows are present in the game world at any one time it triggers some interesting quirks - including a glitched character model of Link in the inventory menu. However, more important than this is the fact is that equipment loading goes a bit bonkers; by changing the selected equipment slot without actually switching the equipment Link is wielding you can transform and even duplicate items. The best part is that this glitch allows you to "drop" the Master Sword - which is done by having it as the wielded weapon - and this causes an in-game message to appear that hasn't (to the best of our knowledge) previously been seen. 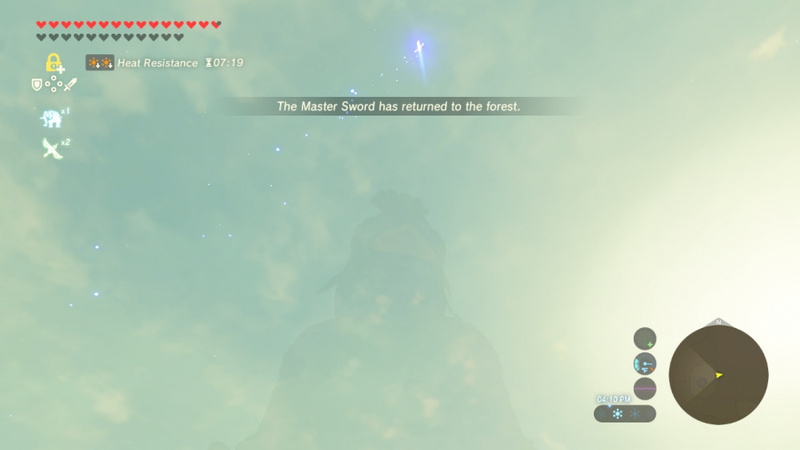 The sword shoots skywards and you are told that "The Master Sword has returned to the forest", but the sword remains in your possession - this could be a possible failsafe feature which was added to the game in a previous build but is now no longer needed. Just how many other cool glitches are going to be found in this amazing game? Time will tell, but let us know if you've triggered this glitch yourself by posting a comment below. Thanks to GFD for the tip and the screenshots used above! Can a second master sword be picked up though? Definitely the best glitch ever! Especially if you can gain two or more Master Swords. That's cool. How did he have so many Hylian Shields and how come their defensive strength was 140 instead of 90? That probably has something to do with the DLC. I came across a couple of glitches the other day,nothing epic like this one though.The first one was when I was up near the top of Mount Hylia,the Divine Beast Vah Naboris looked like she was on her break from helping stave off Ganon as there was no red beam coming from her.About an hour or so after that by pure luck I come across the Forgotten Temple and completed the shrine inside.Once done with that I went to climb back up to where my horse was waiting but it started to rain.I then went back down into shelter to make a fire to sit by and pass some time but just then the rain stopped.So I went to climb up again but the rain came back within seconds.Back down again to my fire the rain stopped.Up again the rain came.5 or 6 times in a row it done this before I gave up and just sat by the fire till morning.It was fine after that. The only glitch I had so far was a few fire keese stuck under the landscape. I tried everything to kill them, and only ice arrows seemed to do the trick. Interesting. So I guess the player did have the ability to drop the Master Sword to free up inventory space at one point, which would warp it back to the pedestal. 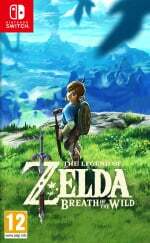 Maybe that was how you'd restore it whenever it ran out of energy in an earlier build but it was thought of as being too discouraging and impractical if the player would have to abandon what they were doing to teleport back to Korok Forest to get the sword again, making them decide to go with the streamlined system we have today instead. @OorWullie The rain thing isn't a glitch... it's a result of the climate... you were on the edge of the Hebra province, where it can't rain due to the cold weather... stepping out of that area caused it to start raining, and stepping back in caused it to stop. There's several areas that cause the same thing due to either hot or cold temperatures... you just don't usually notice as you tend not to hang around on the borders of those areas. @amiiboacid I don't think the DLC will make it possible to lose the Master Sword and force players to retrieve it. I'm guessing that this a leftover piece of a cut gameplay mechanic. My biggest glitch is that I can't seem to turn it off! @DragonEleven That explains it, cheers. Perhaps in the new "hard mode" when the energy runs out the sword will return to the forest instead of the 10 mins recharge time? Seems the Internet and me have different opinions about "epic glitches"
I had a glitch where Farosh spawns from Riola spring lake. I shot him with an arrow and he dropped a scale, he then flew high into the distant sky like he is suppose to. I then proceeded to pull chests from the spring with magnesis, i was standing on the edge of a square stone structure in Riola spring when suddenly Farosh spawned literally centimetres from me in the water. So obviously i shot arrows at him but they went straight through him as if he was air, then he just disappeared before his entire body even left the water....like just vanished. So i looked up into the sky and there he was, tiny, so far away, and you could see the white lines from the arrows i shot at ground level leaving the opposite side of him soooooo far away. Nothing epic but i thought it was cool none the less to see his head leaving the water right in front of me. The only glitch I've gotten wasn't so helpful. I was in the northwest maze when the blood moon came. When it came back to me, I couldn't see anything but I was taking damage fast. I realized that the red sticky stuff with the eyes had spawned all around and on top of me after jumping and trying to move around. More jumping and Link suddenly was holding onto an edge that wasn't there before, and then I fell - through the bottom of the world, with the maze above me. I glided down and snapped a few trippy photos before I died. I respawned and all was ok. I could be wrong, but I think this goes back to when they (possibly) toyed with the idea of letting the Master Sword drop from Link's hands after being electrocuted. If it had dropped, it would have returned to the forest, I guess. Pretty cool! 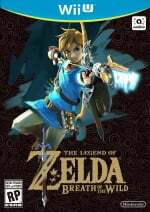 Maybe the "Master Sword has returned to the forest" line was a leftover from an old Eventide Island? @Dangerous25 Best wishes to you man.Zelda's held off Ganon for 100 years, she can wait a few more weeks. Master, you forgot to eat. Master are you sure you picked enough spicy peppers? Master I don't think that you should be using me to chip at ore deposits. Master, did you seriously need to try chopping down a forest with me? Master couldn't you at least TRY to use another sword when chipping at a Guardian scout? Master....ughh, EffU, I'm going home. I sent NL this tip before going to bed and they managed to have an article and video posted hours before I woke up. Y'all are pretty quick on the draw over here. Haha how cool is that? I love the fact they built in this failsafe. It might have also been something considered in previous versions-- instead of the sword running out of energy it goes skyward and returns to the forest. Seems fitting, the Glitch Gremlin loves Zelda after all. The sword doesn't actually reappear in the forest though, right? That rain isn't a glitch but a bad design. You being at the bottom of the forgotten temple and climbing up triggers a new area. Once a new area is triggered a new set of weather patterns is selected. And they will remain that way for quite a while. My only real glitch discovery was to be careful mounting enemies' horses if they've taken a lot of battle damage - the horse died during the animation and I fell through the ground way below the map (there's water under the map). I took pics of it but the Switch lacks an easy way to share them on here (I'd have to load them on an SD card and it's not that impressive or anything). It's a pretty good exception handler, I guess. Kinda like the Chris Houlihan room in A Link To The Past. @OorWullie I've noticed that the weather can be extremely localised, just like temperature changes. @BustedUpBiker I know. What I said was that you can't get a decent picture of it after you pick it up. It'll always be in the sheath whereas if you were able to take a picture of it before picking it up, you could have a nice picture of it in the pedestal. Looking at the first picture: That's not a glitch, but the super-rare invicibility suit! Lol. @Sidon_ZoraPrince, This happened to me as well, except in hylia lake instead of the spring. It's probably not a glitch, but the game is testing the Farosh spawning. It didn't play the music, but oddly, it did appear on my sheikah sensor + which was set to farosh at the time.